We offer the opportunity to pre-book parking in our enclosed section in the nearby Focus car park (Fabriksgatan 45) for SEK 225/night (valid from 15.00 on your day of arrival until 13.00 on your day of departure). If you have not pre-booked a parking space, or you would like parking after hours, a space may be provided subject to availability. Please contact the Guest Service team at the hotel. 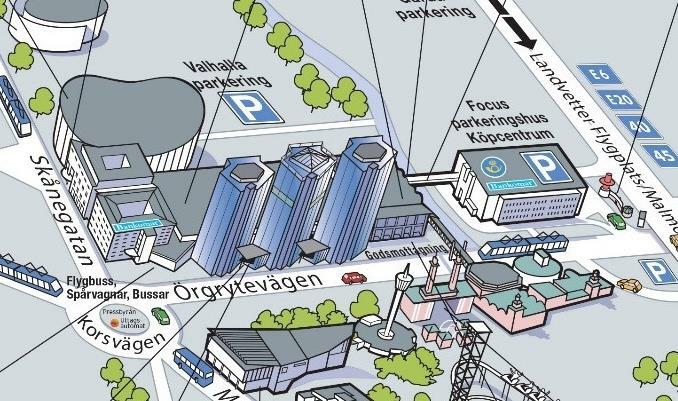 If you have pre-booked and provided us with your car registration number and a mobile phone number, you can drive directly to the Focus car park (Fabriksgatan 45) before checking in. The car’s registration plate will be scanned and the barrier will then open automatically for you at the entrance to the hotel’s enclosed section. The last six digits of your mobile number will be used as a code for the gate when you collect your car. Our system is unable to read these number plates, meaning you do not need to provide your registration number. Instead, please collect a ticket from Guest Service before driving to the car park. If you have not pre-booked parking, contact Guest Service when you arrive and they will help you to book a space, subject to availability. Drive to the Focus car park (Fabriksgatan 45) and take the middle lane at the entrance. Follow the signs for Gothia Towers Focus up to level 3 of the car park. There is an enclosed and locked section for Gothia Towers guests. Once you’ve parked, take the lift or stairs to level 2. You can use the glass bridge to go all the way to the hotel under cover and check in at reception. Don’t forget to click on the link in your welcome e-mail to update your details! The maximum height at the Focus car park is 2.05 metres.